Despite what his name suggests, the Minnesota Timberwolves’ Kevin Love makes war when he’s on the basketball court. The All-Star forward dishes on the playoffs, his toughest opponent and, oddly enough, video games. NBA SOLDIER When he isn’t going to war on the paint, Love unwinds with a different kind of battle. 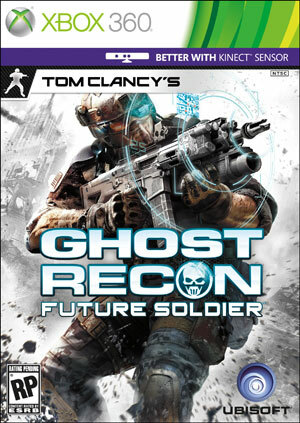 How do you have time to play Ghost Recon: Future Soldier when you’ve got such a packed schedule? The more downtime we have, the more time you have to play games like Ghost Recon Future Soldiers, so for me it’s a fun way to get integrated into video games and for me to have fun with my buddies and team up and go into battle with ‘em, kind of like out there on court. Definitely playing against Russell, kind of a rivalry there in Oklahoma City. Once we jump on the video games it’s still very competitive. Are any of the guys on the team playing with you? As of right now, no. You can pick a group of four and you can go on into battle. It’s very tactical too, but more than anything I like to stay as the sniper. I’m the shooter kind of like I am in my game [on the basketball court]. I like to stay on the outside and snipe guys. Campaign or multi-player guy? Definitely multi-player. I like to go into battle with my guys. What did you do in the off-season to prepare? It was a little different this year because we never really knew when the season was going to start. We didn’t know how many games it was going to be and over how many months, so, for me, I just tried to keep my body and mind right as much as I could. On the court it was doing the basketball five to six days a week, with my trainer, Russell Westbrook, Derrick Rose and some of those guys. Also staying active doing yoga and doing my strength conditioning. Just staying ready, staying active, and wrapping my mind around the condensed season. What’s it like playing in such a condensed season? It’s definitely taking a toll. I’m playing the most [minutes] in the league right now (39.6 Minutes Per Game). Luckily I’m young and I have a great training staff that helps me take care of my body day in and day out. You make sure you’re eating right. Make sure you’re hitting the iron, lifting as much as you possibly can. That’s easier said than done because we don’t have many practice days. Most days we have off, like we do today and I really have to get my ice and stimulation, just keep off my feet as much as possible. Your stats in the past few games are unreal. You’ve had this killer look in your eyes. What’s been going on? I’ve always had that intensity. I think you’re exactly right, the way I approach a game is like I’m going out there to war. I feel like in order for our team to have the upper hand, I have to play extremely well and I have to bring the rest of the team with me. That’s how I feel approaching every game. I just want to continue doing that these last fourteen games so we can make that playoff push. What’s your goal, being a few games out of the playoffs in the West? I think just giving ourselves a chance. We’re four, five games [out of] the four spot, but I think right now our main objective is to be knocking at the door of the eight spot and see what we can do these last 14 games. I think something we can shoot for is being in every game and giving ourselves a chance to win. If we can do that, then it’ll definitely be a successful season and it’ll make us hungry for the off-season. Guys will go [into the offseason] knowing what they have to work on. What’s that piece you think you’re missing to put you over the top? It’s a combination of a few things. I think we need a shot blocker inside, whether we bring him off the bench, because Nikola Pekovic is playing so well that we love having him in the middle. I just think guys need to get older. You look at a guy like Derrick Williams, the more experience the better he’s going to be. We need Ricky [Rubio] to do the same thing, get better from his injury, have a healthy and speedy recovery, but also be watching film and doing everything he can, so when he comes back he’ll be able to have a big impact. Also, add veterans too. We’re one of the two or three youngest teams in the league. As we continue to grow together, if we can keep this unit in one piece and as a team, the sky is the limit for us. That’s probably the biggest thing we need now, is experience and time on the floor together. Who’s the hardest guy for you to play against? When he’s healthy, Zach Randolph for the Memphis Grizzlies has always been somebody that has always been very tough to play against. Also a guy like LaMarcus Aldridge as well. Those two guys pose different match up problems but they’re still very, very tough and very consistent night in and night out.